Owing to their ability to absorb the light and convert it into electron-hole pairs, within few tens of femto-seconds, the surface plasmons act as efficient electromagnetic-to-electric energy converters. Indeed, the photo-created charge carriers may be transferred to molecular states and hence participate to current flow through a network of self-assembled nanoparticles. 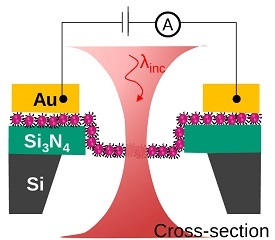 The phenomena of plasmonic photo-induced current is complex and requires detailed theoretical (plasmon decay, charge transfer by electronic state hybridization, tunneling transport, thermally driven transport...) and experimental investigations (time-resolved optical spectroscopy, imaging of photo-current flow). The field of plasmo-electronics should lead to new functionalities particularly in the field of opto-electronics.